Dental crowns and bridges can improve your chewing function and restore damaged teeth. Call Us Today! A dental crown is either an all porcelain (metal free), metal fused porcelain, or full metal cap fitted on top of your natural tooth. It restores both the form and function of your tooth, and thanks to advances in cosmetic dentistry our technicians can fabricate a replacement nearly indistinguishable from your natural teeth. Dental crowns can have restorative or cosmetic function; they can improve the strength of a weak tooth, the function of a chipped or broken molar, hold together a severely damaged tooth, rebuild a tooth after a root canal, or simply camouflage a misshapen or discolored tooth. Dental crowns also anchor dental bridges that replace missing teeth, and form the tooth after a dental implant. The difference between these types of crowns and conventional metal-porcelain (PFM) crowns is that there is no metal base inside the crown. This allows us to fabricate crowns that are more aesthetically pleasing. The push for Metal Free restorations has been successful due to improvements in strength of restorative materials. We no longer need to utilize a metal base for strength due to the fact that metal free restorations have become more dense and as a result stronger. Additional benefit of crowns without a metal base is that there are no more unsightly black edges around aging crowns. When the gums recede the metal edge can shine through. This can cause patients to feel self conscious and people around you will know that you have a crowned tooth. All-ceramic crowns (Full contour zirconia, BruxZir, PFZ, e-max) don't have this problem as there is no metal underneath the crown. Please see the sample on the right. 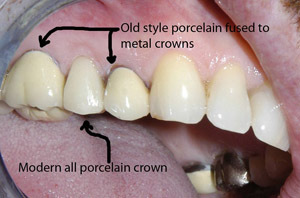 Additionally porcelain-fused-to-metal dental crowns require a greater amount of reduction (tooth trimming) than their all-metal counterparts. For example, metal crowns can be as thin as 1.5 mm on their chewing surface whereas PFM crowns need to be at least 2 mm thick. This is a cast metal dental crown. While sometimes necessary due to space limitation, we do not recommend this option due to poor aesthetics. All ceramic option, does not have a metal base. Recommended for best cosmetic result. 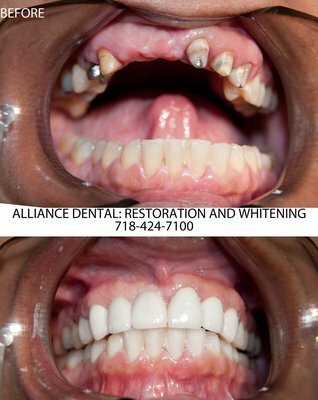 This is one of the examples of restorations we create in our dental office. This patient came in with a removable denture that was ill fitting due to the fact that the patient lost some crowns that were placed years ago. A permanent, non-removable dental bridge consisting of 8 dental crowns (caps) was fabricated for the patient, dramatically improving the aesthetics and giving the patient a reason to smile. Step 1: The doctor prepares your tooth for a crown by reducing and shaping the tooth (multiple teeth if a bridge is needed). An impression is taken and is then sent to our laboratory where technicians fabricate your custom crown and make sure it matches your other natural teeth. Step 2: When you come in for your next visit, we will check the fit and finish of the crown or bridge and will permanently cement it using a permanent dental adhesive. Your tooth is now restored.